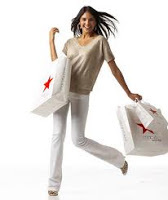 Get excited because Macy's is rolling out another great Super Saturday Sale. Every department is tossing out discounts. Also, if you spend $99 they will take an extra 15-20% OFF and ship to your house for FREE. Since I'm cheap, I instantly went to the extra 25% OFF all clearance part of the sale. So if clearance items are already marked down, then I get the extra 25% off, then spend the $99 and get the extra 20% discount, that's three discounts in one. I'm starting to get lost in the savings. Grab some new clothing, a discount on jewelry, some sheets, bedding, furniture, or other home items... Macy's has it all.